E-Vision’s launches New EV IP IR VF Surveillance IP Camera with H.264 VideoCompression Technology capture videos up to IR distance of 40M. 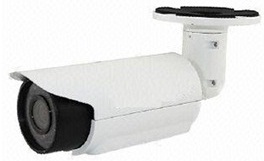 Mumbai / Bangalore, India – March 18, 2014 : E- Vision, announced the launch of EV IP IR VF surveillance cameras. The EV IP IR VF camera captures clarity video pictures up to 1920*1080 resolutions. These cameras capture videos up to IR distance of 40M. The EV IP IR VF camera captures quality rich clear video images under low light conditions with 1.0/1.3/2 mega pixel and 2.8 – 16 mm Manual Varifocal lens. The camera consumes less power compare to traditional IP cameras. EV IP IR VF camera supports ONVIF protocol. Its built-in IR (infrared) LEDs and light sensor makes it suitable for operating in extreme low light conditions. Its H.264 video compression techniques use mathematical algorithms to reduce the amount of data needed to transmit or store videos.